Eric Holcomb is the Republican candidate for governor, replacing Mike Pence on the November ballot. "The only way we continue Indiana's progress is by joining together, which we've done today," Holcomb says. "I will reach out to everyone, even if I don't agree with them on certain issues." The state committee will meet again on August 1 to choose a candidate for lieutenant governor. Holcomb, Rokita and Brooks withdrew from their respective races because state law prohibits candidates from running for two offices at the same time. So, Republicans must nominate candidates to replace all three vacancies on the November ballot. Three office-holders say they're interested in seeking Rokita's seat, but only if Rokita is nominated to run for a statewide office. State Senator Ron Alting of Lafayette, Frankfort Mayor Chris McBarnes and Boone County Prosecutor Todd Meyer must wait to find out whether Rokita will seek the Republican nomination for lieutenant governor. Holcomb is a veteran of the U.S. Navy and a graduate of Hanover College in Hanover, Indiana. He worked on the campaign team of U.S. Representative John Hostettler starting in 1997. In 2000, Holcomb ran for office in the Indiana House of Representatives and was defeated by Democratic incumbent John Frenz. Holcomb worked with Mitch Daniels from 2003 until 2011, first on the campaign trail and then as an adviser and Deputy Chief of Staff after Daniels’ election as governor. In 2010, Daniels endorsed Holcomb for the State Republican Party Chair. Holcomb served in that position until he stepped down in 2013. Shortly after, Holcomb became the Chief of Staff for U.S. Sen. Dan Coats, R-Ind. He served on Coats’ team for close to two years; in early 2015, Coats announced he would not run for reelection. Days later, Holcomb resigned from Coats’ staff to join Marlin Stutzman and Todd Young seeking to fill the open seat. However, Holcomb withdrew from the Senate race before the primary election, just before Lieutenant Governor Sue Ellspermann resigned her position to seek the presidency at Ivy Tech Community College. 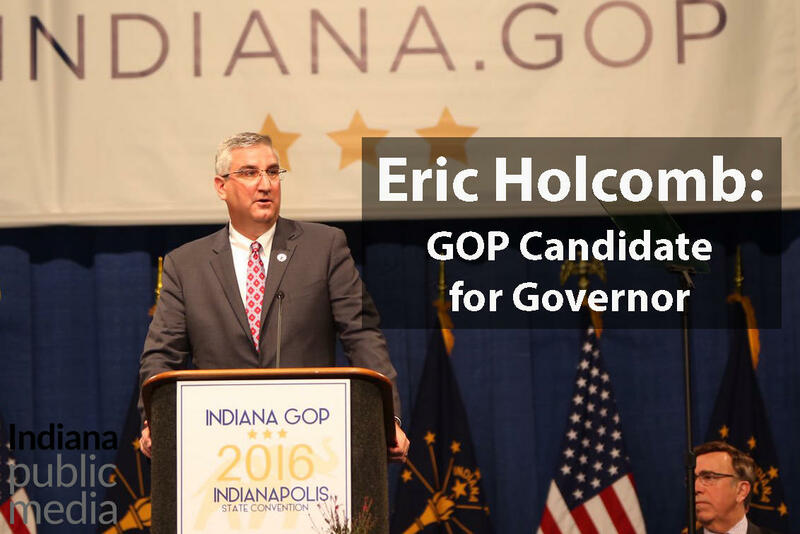 Pence chose Holcomb to replace Ellspermann as his Lt. Gov. and running mate for reelection in 2016. Holcomb was sworn in on March 3. When Gov. Pence withdrew his name from the gubernatorial race on the deadline to withdraw from the Indiana ballot, Holcomb withdrew his own name from the ballot and announced his desire to run for governor. Democratic governor candidate John Gregg says he may have a new opponent, but Gregg says he remains focused on his plan to create jobs for middle class residents. "For too many Hoosier families, wages aren’t keeping up and the good paying jobs we are losing aren’t being replaced," Gregg says. "Eric Holcomb wholeheartedly embraced the failed approach that embarrassed our state, cost us jobs and has left the middle class behind."